Animals wait in their pens to be adopted at the Palm Valley Animal Center Tuesday, Feb, 13, 2018, in Edinburg. 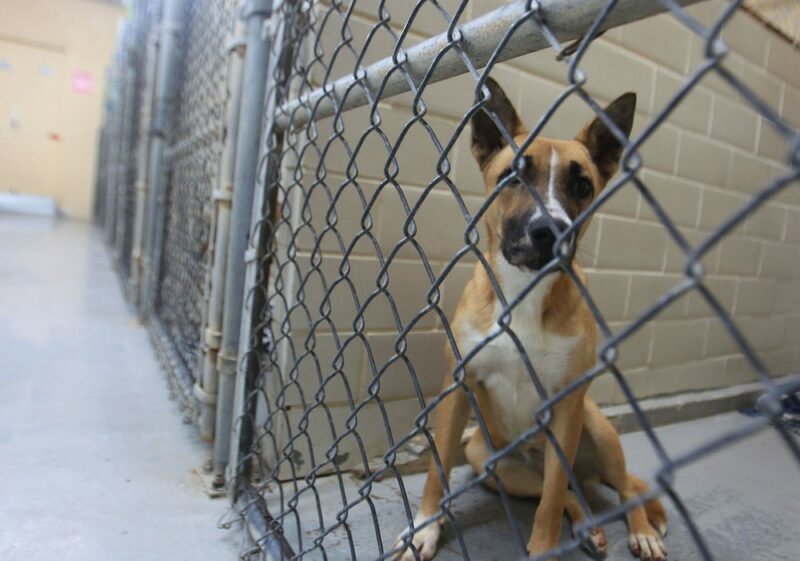 EDINBURG — Almost a year after staff and board members of Palm Valley Animal Center received criticism and threats regarding the conditions of their facilities, the shelter has managed to increase its live-release rate by about 20 percent. “It didn’t come cheap,” said Rebecca Villanueva, director of development at PVAC. The negative attention they received helped them obtain grants and donations from national animal welfare organizations. They were able to temporarily increase staff and build onto their facilities. But as those funds and equipment begin to run out, the shelter is looking to continue funding their operation in a way that helps them reach a “no-kill” status. The shelter has determined that the fundraising goal for that endeavor is about $1.5 million, which is significantly more than they have ever raised. In 2017, the shelter had a live-release rate of 33.1 percent. In 2018, that figure jumped to 52 percent. In order to be considered a “no-kill” shelter, they have to reach over 90 percent. One way the shelter is cutting euthanizations is by negotiating with its municipal partners. When the current contracts were negotiated in October 2018, many cities, including the shelter’s hometown of Edinburg, decided not to immediately renew contracts. PVAC raised its per-animal rate from between $20 and 25 to $80 and 90. The rate increase came after Edinburg sent twice as many animals to the center as the previous year, resulting in triple what the city paid last year — about $500,000 to be precise. They negotiated down to $350,000 under the agreement that Edinburg would manage its own wildlife (opossums, raccoons, etc), have a cap of 4,500 animals a year and allow PVAC access to its animal control facility. Similar agreements were reached with other cities. Though that change alone has helped lower PVAC’s intake by about 2,000 animals from 2017 to 2018, Villanueva said the fees still only cover the cost of intaking an animal. Finding live outcomes still requires external funding. For example, transporting animals to rescues as routinely as they do costs them resources and staff. Last year, PVAC increased the amount of animals transported to rescues. In 2017, 6,031 animals were transported. That figure jumped to 8,000 in 2018, and their goal for 2019 is 10,000. With the negative attention incurred last year thanks to a video circulating on social media that showed the center’s conditions, PVAC often called on the community to both reflect on their behaviors and for support. As a result, the shelter adopted over 2,000 more animals in 2018 than in 2017. PVAC was also able to expand its foster program by more than threefold. The foster programs allow animals being sent to rescues to be housed in someone’s home while the shelter continues to take more animals. When the shelter runs out of space, euthanization is often the only way to contain the spread of diseases. In 2017, 518 animals were placed in foster homes. In 2018, that number jumped to 1,838. The shelter has also seen a significant increase in the amount of pet owners using their spay and neuter services. Though this helps keep the Valley’s pet overpopulation issue down, it’s a service that the shelter needs to find ways to keep funding. “These are all good signs, but we need to figure out how to continue funding these programs,” Villanueva said. ”Looking at the numbers, it’s undeniable that there’s great work being done here. J. Edward Moreno is a digital content producer for The Monitor. He can be reached at emoreno@themonitor.com or (956) 683-4433.